The contract to build Charles Drew was awarded to National Steel and Shipbuilding Company (NASSCO) of San Diego, California, on 31 January 2008. Her keel was laid down on 17 March 2009. Charles Drew was christened and launched on 27 February 2010, sponsored by Mrs. Bebe Drew Price, the eldest daughter of Dr. Drew. The principal address at the ceremony was given by Vice Admiral Regina Benjamin, the Surgeon General of the United States. Charles Drew was delivered to Military Sealift Command on 14 July 2010 and began conducting missions for MSC in spring 2011 and will operate in the Pacific.Charles Drew was moored at Naval Magazine Indian Island during the week of 30 October 2011 according to the website www.siitech.com which tracks AIS signals broadcast by ships' navigation systems. 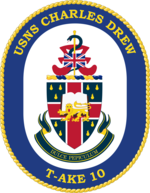 ^ a b c d "USNS Charles Drew (T-AKE 10)". Naval Vessel Register. United States Navy. 20 March 2009. Retrieved 2010-07-15. ^ a b Seal, Laura M. (14 July 2010). "The Navy's Newest Dry Cargo/Ammunition Ship Delivered to MSC". Navy News Service. NNS100714-13. Retrieved 15 July 2010. ^ "Navy Names Four Ships After American Pioneers". U.S. Department of Defense. 2 December 2008. Retrieved 2010-10-14. 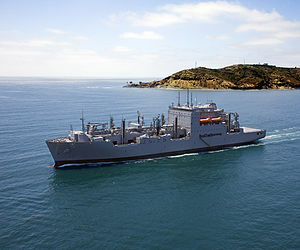 ^ "General Dynamics NASSCO Launches USNS Charles Drew" (Press release). PRNewswire. 27 February 2010. Retrieved 2010-02-27. Wikimedia Commons has media related to USNS Charles Drew (T-AKE-10). "USNS Charles Drew (T-AKE 10)". T-AKE Photo Gallery. NASSCO/General Dynamics Corporation. 2009. Retrieved 2009-04-11.